The KrAZ-255B (6 × 6) 7,500 kg truck entered in production in 1965, with full series production commencing in 1967. The KrAZ-255B was the direct replacement of the earlier serially produced KrAZ-214 7,000 kg (6 × 6) truck. The KrAZ-255B (B1) was a later model that featured a revised braking system.The KrAZ-255B had some visual similarities with the earlier KrAZ-214 but had a more powerful engine, a V-8 four-stroke diesel developing 240 hp to replace the six-cylinder two-stroke 205 hp unit of the KrAZ-214. Other design improvements included a hydraulic steering booster replacing the pneumatic booster of the KrAZ-214, and the standard 1400 × 20 tyres of the KrAZ-214 were replaced by new wide section pressure adjustable tires with a centralised tire inflation system controlled by the driver directly from cab. 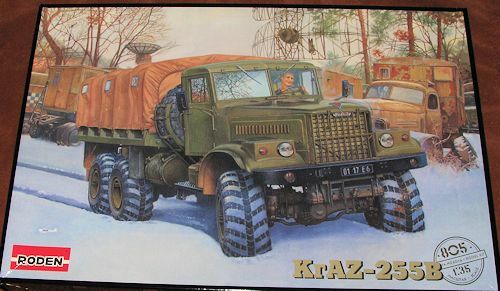 In 1976 the KrAZ-255B was equipped with a new dual-circuit braking system that replaced an earlier single circuit system, and such vehicles were given the revised KrAZ-255B (B1) model designation. Many of the roles previously undertaken by the KrAZ-214 were transferred to the KrAZ-255B when it entered series production, these including carrying and laying the TMM treadway bridge; carrying and launching the PMP heavy floating pontoon bridge; carrying and launching the BMK-T bridging boat; mounting of assorted engineer/construction equipment and cranes including the USM pile driving set, the E-305 BV crane shovel, and the EDV-4421 excavator; assorted tankers including the ATsM 7-255B 7,000 litre fuel tanker towing the PTsM 8925 5,800 litre trailer. With Roden releasing the earlier KRAZ-214 it should come as no surprise that they'd do the follow-on vehicle as we l since they both used many of the same parts. The biggest difference is in the engine and the cab design, which is a tad more modern than the WWII era 214. 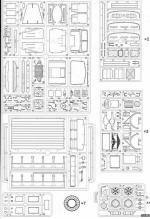 The box is jam packed with green and black sprues. 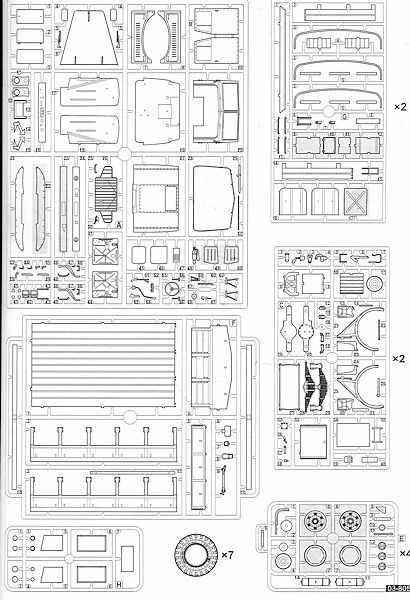 Unlike the earlier kit, there is no vacuformed bed cover. The tarp hoops being supplied can be modeled in the stored position if so desired. One thing to note is that unlike the earlier kit, the wheel centers are separate items so no need to cut one out for the spare. The bed has the usual cross braces and flaps on the underside. The sides are equipped with bench seats which can be modeled either up or down. The driver's compartment is also very nicely detailed. There are separate pedals for the throttle, clutch and brake. Also separate are the hand brake, gear shift lever and the transfer case shifters. Each door panel has separate handles on the inside and the door inner liner is a separate piece as well. 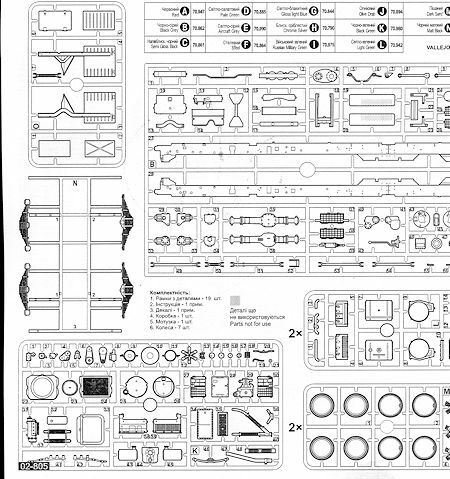 The clear bits are well done and should fit without issues. Those wishing to have the door windows down can do so by doing a bit of cutting. These doors can also be posed open if one so wishes. The kit includes a power winch and a length of thread is provided for the cable. Instructions are top notch with color information throughout the build. These are keyed to Model Master paints. 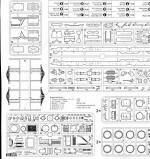 Markings are provided for seven vehicles and are, for the most part, basically either just door insignia, different plates or both. Those in green overall are for the Ukraine Army, East Germany, Hungary, Czech Army, and Soviet Army. One with large black green bits is a Soviet version while another with a more complex pattern including dark sand and light green is with the Russian Army. 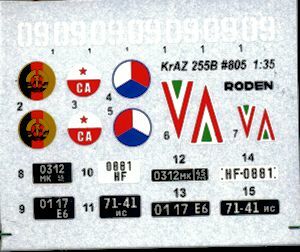 The decal sheet is well printed with the Hungarian markings being off register. The image has been darkened to make the white easier to see. Another superb effort by Roden for the heavy truck fans out there. This vehicle was also sold in a civilian version and many ex-Army trucks were purchased by private operators so there is no lack of possible markings for this one.